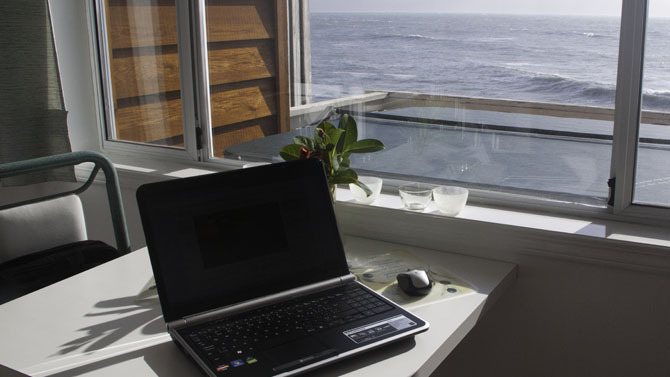 Internet enabled devices with wi-fi can connect from all cottages to the internet. The current access code for the access point is provided at check-in. The wireless access point offers excellent signal strenght and sensitivity. Wireless mode is 802.11b/g mixed; security mode WPA2-PSK with AES encryption. The intended use of the wi-fi is for communication and web browsing, but not for downloading or streaming video content. As stated before, technical equipment can fail and therefore we cannot guarantee interruption free entertainment and communication services. Each cottage has a telephone and calls within North America a free of charge. All cottages share one outside line and therefore the line cannot be blocked for extended periods of time. If the line is blocked for a long time and other people try to phone out, our telephony system will disconnect the call. If longer conversations are necessary, an internet device can be used to make internet telephony calls. A few km west of Sooke begins an area with bad or no reception for most cell phones. If your carrier uses technology that is compatible with the cell phone standards on the US side of the Juan de Fuca Strait you probably will be able to roam on the US network. As all cottages have a telephone, you can be reached by phone at all times. Ask at check in for your extension number and give it to the party that might need it. We do not transfer calls to the cottages when the office is closed! Guests can access in the cottages the internet with their wi-fi enabled devices. However, as not everybody might bring such a device, there is also a computer in the reception which guests can use for webmail. Guests are fully responsible and liable for their use of the internet.